This fact is just one of the many alcohol related facts you will learn more about during Alcohol Awareness Week. Since there are no classes on Monday and Tuesday, we kick off our schedule of events on Wednesday with the "Beer Goggle Challenge." Come on over and try on our goggles that simulate how your vision and senses become impaired with the consumption of alcohol. 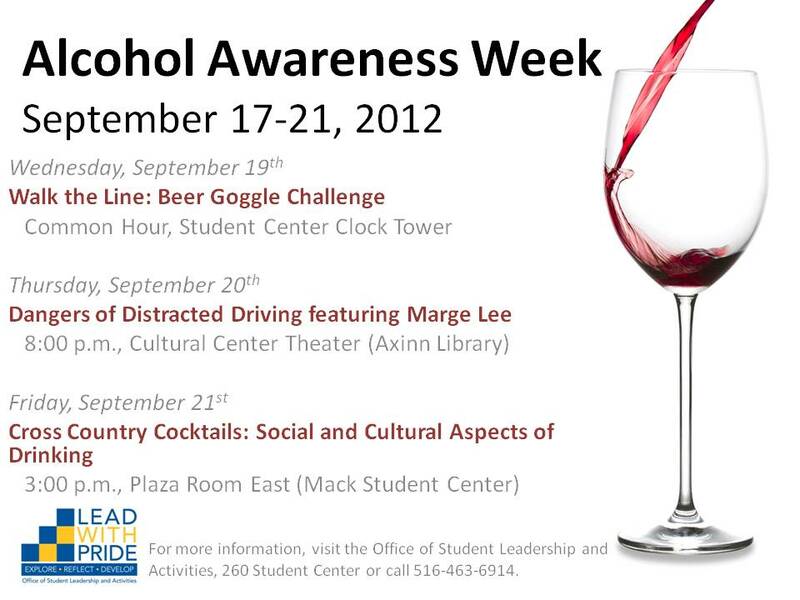 The first 50 participants will receive a prize and a fact about alcohol awareness! On Thursday, Marge Lee will return for the second year in a row to Hofstra, when Alpha Kappa Alpha and the Office of Student Leadership and Activities present "Dangers of Distracted Driving." Ms. Lee will give the Top 10 "no-no's" that can distract you while driving... which includes texting, and driving under the influence. Come hear what her Top 10 are and grab some free food! Friday night features "Cross Country Cocktails,"co-sponsored by the Office of Student Leadership and Activities and the Multicultural and International Student Programming Office. An international student panel will discuss the differences and similarities of the culture surrounding alcohol and drinking in their home country. Join us for a great discussion and come prepared to ask our panelists questions. Light Refreshments will be provided. 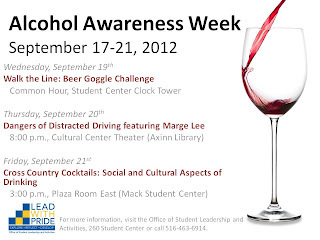 Stay tuned to HofCast for more facts about Alcohol Awareness, too! For more information, feel free to call the Office of Student Leadership and Activities at 516-463-6914. Every school should have an alcohol awareness weak! So much can be learned, and it might save a life!